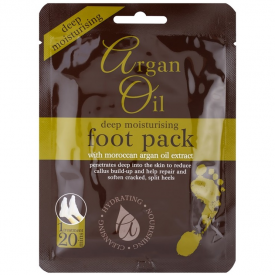 This Argan Oil Moisturising Foot Pack contains argan oil and is enriched with shea butter to penetrate deep into the skin to reduce callus build-up and help repair and soften cracked, split heels. Great very reasonable priced foot treat with many natural ingredients. Each pack has a pair of &quot;socks&quot; that you pop on your clean dried feet then sit back and relax.